The character's bumbling destruction is not a bad metaphor for the complexities of IT. 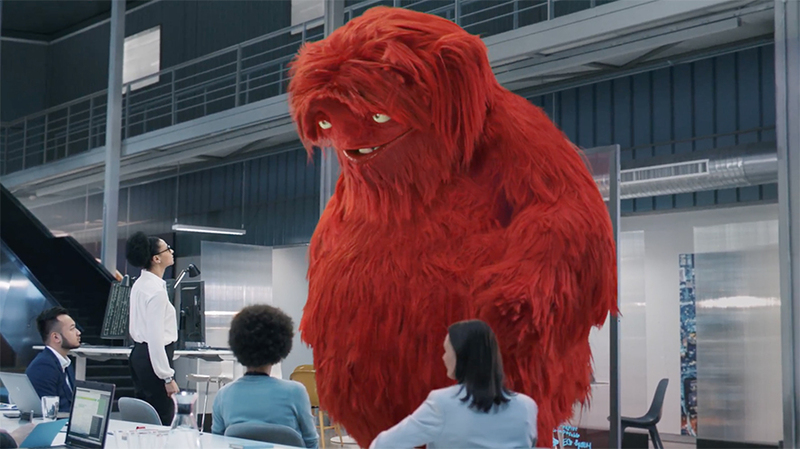 The complexities of modern information technology (IT) can make it seem like something of a monster, which is precisely how Publicis New York personifies IT in a new campaign for Hewlett Packard Enterprise. A 30-second spot opens with a voiceover explaining, “IT can grow out of control: disrupting business, taking on a life of its own,” as a friendly-looking but gigantic red monster seems to unintentionally wreck havoc. These problems, the voiceover continues, can create friction and slow innovation, as the company in the spot seems to struggle with some sizable IT issues. Of course, the spot concludes by presenting HPE as the solution to tame the monster (with its OneView and OneSphere products), which appears to disappear in a cloud of green smoke. It’s kind of hard not to feel bad for the poor thing as its fur gets cleaned off the floor. The character’s bumbling destruction is not a bad metaphor for the complexities of IT. In some ways the approach is reminiscent of BBDO New York’s personification of a “scary idea” in its 2014 “Ideas Are Scary” spot for G.E., although it trades in that ugly duckling transformation ending for a “taming” of I.T. that appears a bit more explosive than we anticipated. The global, digitally led campaign will run in the U.S., U.K. Germany, France and Japan. Ads will run on broadcast as well as online, and the campaign also includes digital display, OOH, social media, events and search elements.